No matter how much you spend on marketing campaigns to attract students, an increase in inquiries and applications might still see a decrease in enrolled and deposited students. Times are changing, and the marketing strategy employed by higher education must change with it. Students are independently researching their increasing options, no longer relying on direct marketing campaigns and carefully assembled admissions packets. They have questions, and if you don't supply the answer, another school will. This transition comes with the opportunity to be more intentional about your marketing process. Outbound marketing is often impossible to track, difficult to target and impractical to quantify. Inbound marketing allows you the freedom to attract your target market with quality content relevant to them, through easily analyzed means. Value Based is working with colleges and universities to create and deploy inbound marketing campaigns, using the latest digital automation technology, to access and attract best fit students while improving application-to-enrollment ratios for less cost. The emphasis here is on "less cost". Let us do the same for you. Hubspot states that schools utilizing inbound marketing "are seven times more likely to report higher ROI than schools using outbound marketing." Additionally, "inbound leads and applicants are three times more qualified than leads acquired through outbound methods." Inbound marketing improves ROI and allows schools to reach and enroll the most qualified students for their programs. 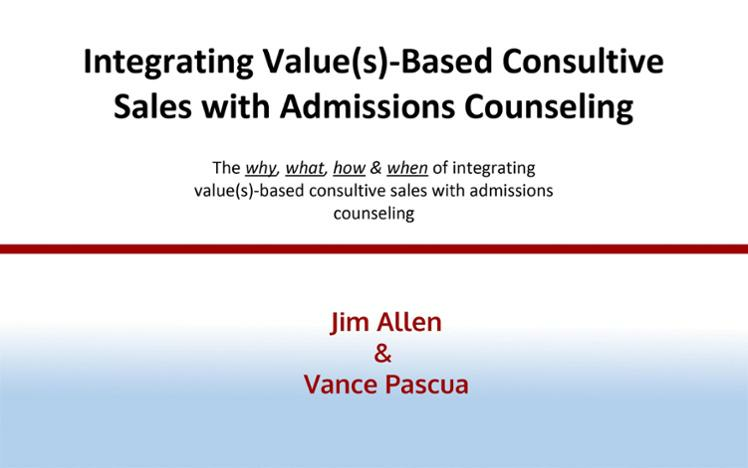 Learn: The "why", "what", "when", and "how" of Integrating Value(s)-Based Consultive Sales with Admissions Counseling.